...but, uhh, none of the contestants got it. 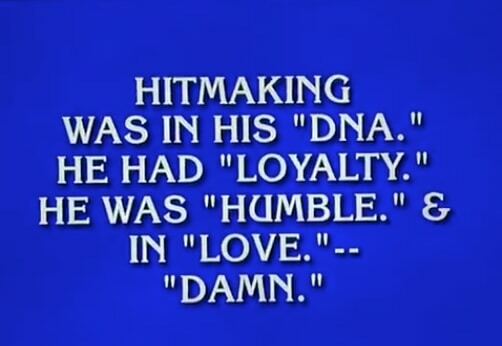 Earlier tonight, Kendrick Lamar was the $2000 answer in the "Recent R&B and Hip-Hop Hits" category on Jeopardy. Spoiler alert: none of the contestants guessed correctly. Regardless, the clip is still worth watching, if only to hear Alex Trebek mutter "he was 'HUMBLE.,' and in 'LOVE.'... 'DAMN.'" Peep it below.